We've had a nice life. The end is near and we just want a car, perhaps our final one, that will provide sumptuous comfort and restrained refinement. Enter the Toyota Avalon, which we had the pleasure of piloting for a week. The 2017 model arrived in "lost in the crowd" silver, which is really the ideal color for this car, with a hybrid set up finished in the highest 'Limited' trim. This clearly wasn't going to be an exciting week, so we relaxed, threw some podcasts on the Bluetooth system and got ready for a stress-free week. The first thing that became instantly apparent behind the wheel of the Avalon is that Toyota didn't build this car with driving enthusiasts in mind. Imagine for a moment that a driving dynamic was a physical, tangible orb that could be held in your hand. When Toyota built the Avalon, it purposefully left it devoid of these driving dynamic orbs. The entire car is engineered to feel like you aren't actually driving. The steering offers virtually no feedback through the wheel, the suspension floats over bumps like they simply aren't there, and the brakes (like most hybrids) have a very odd feel thanks to regenerative braking. The pedal barely needs to be pressed to bring the car to a halt, and offers almost no feedback. It may sound like we are bashing the Avalon for having zero driving dynamics, but that is only because we are enthusiasts. If we take a sensible approach when looking at this car, all of these "drawbacks" start to become stand-out features. The Avalon will do little to make a S-Class owner jealous visually, but when comparing ride comfort it's hard to see why the Mercedes costs more than twice as much. There are plenty of consumers that would love to own one of the most comfortable cars on the planet, but don't want the attention and image that an expensive car offers. The Avalon is just as comfortable as cars that cost well over six-figures, but doesn't draw attention to the owner. We would say that the Avalon is the ideal final car for any retired individual. 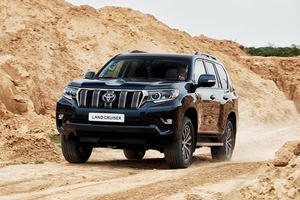 The car is built by Toyota, so it will last longer than you will and the interior is spacious enough for the grandkids to ride in the back without any complaints. To drive, the Avalon doesn't offer much in the way of fun. There are a few buttons that will only get pushed when the grandkids are in town and ask to drive the car. The Sport mode sharpens up throttle response and makes the car much more willing to deliver power. Eco mode does the opposite, and makes the driver depress the throttle more to gain any form of reasonable acceleration. There is also an EV mode that shuts off the engine. Unfortunately, EV mode only works at low speeds (about 20 mph) and can only reasonably be used for very short trips. EV mode will also occasionally engage by itself during normal driving, and is indicated by an EV light in the gauge cluster. We noticed that the EV mode was ideal for slow, stop-and-go traffic where the Avalon could creep along without using a drop of gas. We failed to match the car's EPA ratings of 40 mpg city and 39 mpg highway, averaging around 33 mpg city and 32 mpg highway instead, mainly because wedidn't have to deal with heavy traffic and slow speeds on our commute. When we attempted to hypermile the Avalon after hours, we were able to get around 45 mpg around town. The Avalon may not have hit its EPA targets, but on a long road trip we got more than 400 miles of range on one tank of gas. The Avalon runs on regular fuel so it is a very cheap date to fill up its 17 gallon tank. Even though this large car is also frugal, it never felt like a burden in acceleration. 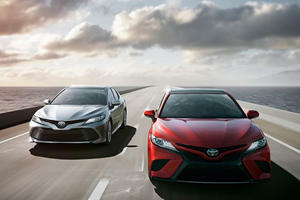 The car can hit 60 mph (not that an Avalon driver will ever do a 0-60 run) in 7.4 seconds, which is about a second slower than the gas-engine V6 model. The car produces 200 hp from a 2.5-liter four-cylinder engine and an electric motor with a 245 V nickel-metal hydride battery. Power goes out through a CVT transmission to FWD. While not our favorite gearbox, this one seems right at home in the Avalon. When put in Sport mode, the Avalon will drop down quickly and accelerate with ease. The CVT does almost nothing to simulate real gear shifts, which is fine for a car that is practically silent in most driving situations. There is a "manual" mode that acts like the old 4-3-2-1 gate on an automatic. This allows the drive to lock the car up to a certain "gear" and is also the only way to make an RPM meter appear on the center screen. In normal driving, the Avalon forgoes a traditional tach in favor of a dial that says "power, eco and charge." We saw this same dial when we tested the Lexus RX 450h, but that car had a sport mode than changed into a standard tachometer. We actually prefer the hybrid system in the Avalon to the one in the Lexus. The Avalon's four-cylinder system felt more seamless than the V6 system in the Lexus. The car was able to start off with electric power, then fire up the engine seamlessly without shaking the car. This is definitely one of the smoothest hybrid drivetrains on the market. The Avalon doesn't feel like driving a car, it feels like steering a living room sofa. So it's a good thing that the interior of the Avalon is a pleasant place to be despite Toyota lagging behind on certain tech. 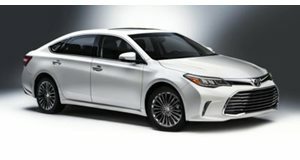 Our Avalon Limited was full of features like Toyota Safety Sense (which includes pre-collision detection, lane departure alert, auto high beams and radar cruise control), blind spot monitoring, a power moonroof, rain sensing wipers, three-zone automatic climate control and heated/ventilated front seats and heated rear seats. The Avalon also comes with Toyota's Entune infotainment system, which lacks Android Auto or Apple Car Play. The seven-inch touchscreen does have navigation and back-up camera built in, but we'd like to see a system refresh here. Toyota really tried to make the interior of this Avalon more exciting than previous generations. Most of the buttons on the dashboard are touch-sensitive rather than physical. We don't think that this design will age well, and it looks a bit like something GM would have done in the 1980's or today with Cadillac's CUE. The Avalon may looks pretty futuristic on the interior, but everything that you can touch is plush in a way that gives a feel of high quality. Rear passengers even have a rear sunshade to make the journey more comfortable. We wish that the Avalon had a few more modern features, like an adaptive cruise control system that could bring the car to a full stop instead of shutting off below 30 mph. The Toyota Avalon wasn't built to be an exciting car. The design just blends into the background. We think that the only way to make this car more exciting would be to strap rocket boosters on the sides. Toyota has target an audience that is more concerned about the destination than the journey. The ideal Avalon driver would rather be on their living room sofa than behind the wheel of a car. Luckily, the Toyota Avalon is just the car for this type of driver. Much like the average Avalon driver, the full-size sedan segment is fading fast. Hyundai just discontinued the forgettable Azera, which leaves little competition for the Toyota Avalon. The full-size segment is limited to the Toyota Avalon, Chevy Impala, Kia Cadenza, Nissan Maxima and discontinued Chevy SS. Toyota says it's devoted to keeping this segment alive, but we think that the Avalon is the perfect candidate for an EV model moving forward. Toyota should offer an all-new, all-electric Avalon as a true Tesla rival. We think that the quiet personality of the Avalon would be perfect for an EV model, and Toyota would be crazy not to build it when the next-generation arrives. Photos courtesy of @magarifilma. 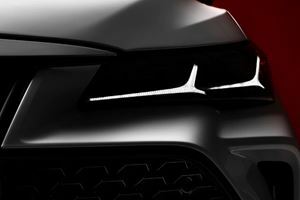 The fifth generation Avalon will soon arrive. Look busy.